I categorized my mods into different categories which you can find in the mods submenu. You can also browse the download archive for a quick overview. If you don’t know what mods are, please read the following section about mods. What are mods and how do I install them? Mods exspand the game with new content such as new weapons, armors, houses or missions (quests). You can find everything else about mods in the Beginners Oblivion modding guide and the Oblivion mods FAQ. If you have a problem with one of my mods, please the read the readme of the mod first. Another solution could give you the guides I mentioned before. Mods tagged with this tag require a body replacer (click on “HGEC/Exnem” and “Robert Male” tags in sidebar’s tag cloud on the right to find out which of the mods require a body replacer). You can find these mods on Oblivion-Nexus. I can’t link them because they are adult content. If the body textures are not displayed correctly, you can solve these issues in most cases by wearing clothing/armors which are compatible with the body replacers or use races which come with compatible textures. That’s why I recommend the installation of default clothing and armor replacers for HGEC, Exnem and/or Robert Male. 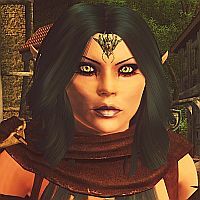 The “default body” tag stands for mods which are compatible with Oblivion’s default body.